This Official Forbidden City Map gives a schematic overview of The Forbidden City area sitiuated within the Walls and Moat of the Former Imperial City. The Map includes to the North and Top of this Map: The Palace Museum ( Forbidden City ) within its walls, gates and surrounding moat , to the South and bottom of this Map: Gate of the Meridian (Wumen) or the main South Gate of the Palace Museum and Forbidden City Grounds. The most Southern Gate depicted is Wu Men ( or the Gate of the Meridian ) that historically served as the Palaces' Main Gate and is now The Palace Museum Main and only Gate for visiting Guests. The Gate of the Meridian stands some ways to the North of Tian An Men at TiananMen Square and the secondary Upright Gate (DuanMen) North of TiananMen. Visitors have to pass these Gates before reaching the Meridian Gate. The Northernmost Gate depicted is the Shenwu Men or North Gate of Divine Military Genius. In between these gates lie the various structures of the Palace proper. These are the Outer Walls and Moat, as well as the grand and ceremonial Outer Court (Wai Chou) and the labyrinth of the Palaces of the Inner Court (Nei Ting), which are subdivided into their semi symetrical Eastern and Western Sections set up to balance across and invisible Central Axis or Line which leads through the south Gate to the Main Throne Hall and then beyond into the Emperor's private realm. Introduction to the Forbidden City (The Palace Museum) Schematic Map No. 2. 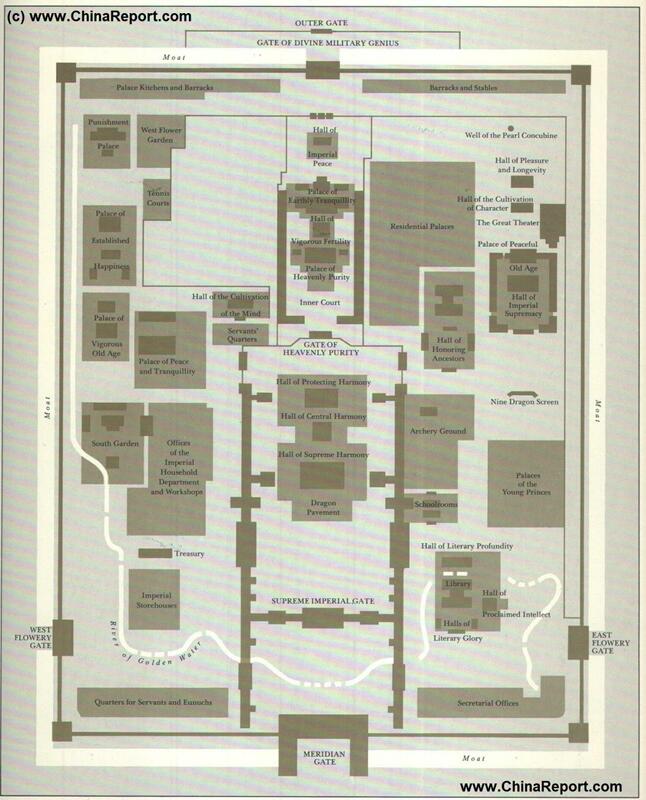 The Official schematic Map of The Forbidden City, by The Palace Museum. With links to further information on the various sections.